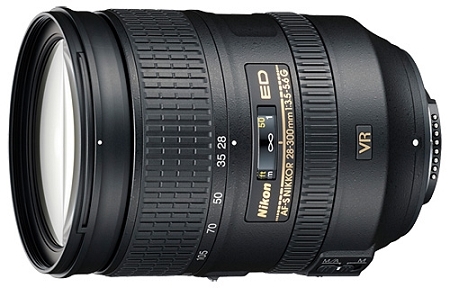 The Nikon AF-S NIKKOR 28-300mm f/3.5-5.6G ED VR Zoom Lens works on both FX and DX-format D-SLR cameras. The lens features a broad zoom range, and it close-focuses down to 18" at every focal length. On an FX body, the AF-S 28-300 ED VR covers nearly every aspect of travel, landscape, and portrait photography - including those elusive distant subjects. On a DX-format camera, the apparent focal length gets a 1.5x bump and it turns into a long-range ace-up-the-sleeve. The VR II image stabilization allows you to handhold the your camera at up to 4 shutter speeds slower than would otherwise be possible, assuring dramatically sharper still images and stable video capture. For critical focusing-moments the lens has a M/A focus mode switch that allows the photographer to quickly change between manual and autofocus modes. The autofocusing is remarkably smooth and quiet - thanks to Nikon's silent wave motor system. The aperture diaphragm boasts no fewer than 9 blades that produce a rounded opening - a feature that will be greatly appreciated by bokeh-lovers everywhere! The lens elements have been treated with Nikon's Super Integrated Coating - an optical lens coating process that maximizes light transmission while enhancing clarity and contrast. All of these world-class features add up to the AF-S 28-300 ED VR being a go-to lens for just about every adventure.